Ontario Fishing Directory - Lures and Tours Blog: St. Catharines Muskie Conservation Show Features Gord Pyzer! St. Catharines Muskie Conservation Show Features Gord Pyzer! Support Muskies! 2013 Muskie Odyssey Show Dates Set! Saturday April 13th, 2013 St. Catharines, Ontario the 2013 Muskie Odyssey supporting Muskie Research, Education and Conservation welcomes fishing enthusiasts and conservationists to join them for great speakers, fabulous deals on muskie tackle and gear, and a silent auction. Be sure to purchase your tickets in advance as seating may be limited. 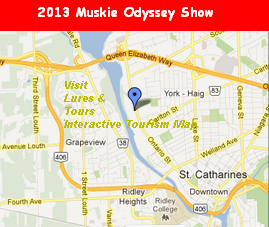 2013 Muskie Odyssey at Holiday Inn and Suites Parkway Conference Center, St. Catharines, doors open at 8am and is cited as the best muskie show north of the border. LuresAndTours thanks Ben McWhinney, active Muskies Canada Inc member, who hosts Ben McWhinney Outdoors'for following LuresAndTours on Facebook, and sharing this important event with us. 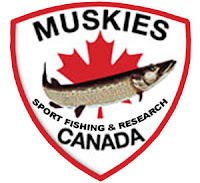 Muskies Canada is an angling club whose interests extend beyond the mere catching of fish. We also share an interest in the preservation of our target species, Muskellunge, and we hope to enhance this fishery by our direct involvement in the management of the species. The projects and programs we are managing have all been designed to raise the public's awareness of the muskellunge fishery as well as to protect it. JIM SARIC - Editor of Musky Hunter Magazine and host of Musky Hunter TV Show. One of North America's best known musky anglers and lecturer. GORD PYZER - Field Editor for In-Fisherman Magazine and Outdoor Canada, a very knowledgeable muskie angler, especially about Lake of the Woods. MARK ARENA - One of the founders of Red October plastic baits. A skilled muskie angler who fishes extensively with soft plastics for muskie across North America. Tickets for the St. Catharines 2013 Muskie Odyssey are $15.00 CDN/US Advance or $20.00 CDN at the door Call Vince Giuliani 519 - 886 5797 today to reserve your tickets. Where are you following this event? Did you see the 2013 Muskie Odyssey at these links? Add your links where you saw this event in the comments too! Where are you sharing this event to help Muskie Conservation efforts?